Last year, , so it’s only natural that we’re starting to see more of them being shown off in public by their owners. Most examples of the 1,400-hp hypercar that have been delivered so far sport either a one or two-tone paint finish. This Chiron, however, is quite possibly the most extravagant example we’ve seen yet. Spotted roaming the streets of London at night, the owner of this Bugatti Chiron has specified the hypercar with a clear paint job exposing its full carbon fiber body. 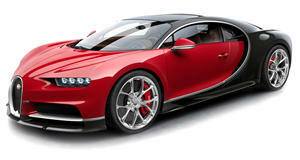 It's available as an optional extra for Bugatti customers that reportedly costs an extra £500,000 ($705,475). Bear in mind that a standard Bugatti Chiron costs around $2.5 million to start with. For the price of the optional extra, you could buy a brand new Lamborghini Aventador S and still have a considerable amount of spare change leftover. Contrasting the dark carbon fiber finish are bright blue accents peppered throughout the hypercar, including on the front bumper, grille, and Bugatti’s signature C-shaped line on the profile. More blue accents have also been added to the brake calipers, the visible engine in the rear bay, and even the Bugatti logo on the rear. On both sides, the hypercar also includes the words ‘Ettore Bugatti’. It’s not uncommon to see exotic supercars on the streets of London, but this carbon-bodied Bugatti Chiron’s menacing appearance certainly makes it stand out from the crowd. It’s probably not surprising to learn that the owner is from Qatar. According to the video description, the clear carbon Chiron is part of the owner's coveted collection of exotics including the hypercar holy trinity comprising a LaFerrari, full carbon McLaren P1, and a Porsche 918 Spyder. This eye-catching Chiron is one of 70 cars that have been delivered so far out of the 500 planned for production. Not being frugal with the options list will inevitably bump up the cost, so we’d love to know how much the owner paid for this custom Chiron.